All life on Earth needs water in some form. Water...two parts hydrogen, one part oxygen. Next to air, this element is the most essential for our survival. Whether it's from the tap or a bottle, water is not given much consideration by developed countries. Most of us take it for granted. It makes up more than two thirds of the weight of the human body, and without it, we would die in a few days. The human brain is made up of 75% water; blood is 83%; bones are 22%; the liver is 96% and lungs 86%. Total body water as a percentage of total body weight decreases progressively with increasing age. By the age of 60 years, total body water (TBW) has decreased to only 50% of total body weight in males mostly due to loss of muscle mass and an increase in adipose tissue. A mere 2% drop in our body’s water supply can trigger signs of dehydration: fuzzy short-term memory, trouble with basic mental calculations, and difficulty focusing on smaller print, such as a computer screen. Are you having trouble reading this? Drink up! Mild dehydration is also one of the most common causes of daytime fatigue. Just a 5% drop in body fluids will cause a 25% to 30% loss of energy. An 11%+ drop in body fluids will cause death. An estimated 75-80% of people have mild, chronic dehydration. Pretty scary statistic for a developed country, where water is readily available through the tap or bottle. 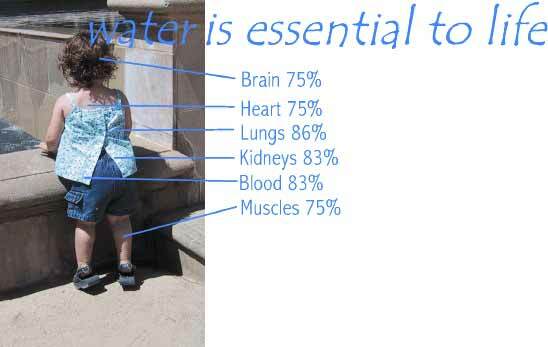 Water is important to the mechanics of the human body. In fact, all the cell and organ functions made up in our entire anatomy and physiology depend on water for their functioning. Water helps keep your muscles and skin toned, assists in weight loss, transports oxygen and nutrients to cells, eliminates toxins and wastes from the body, and regulates body temperature. Drinking refreshing, clean water plays a major role in reducing the risk of certain diseases. Drinking eight glasses of water daily can decrease the risk of colon cancer by 45%, bladder cancer by 50% and it can potentially even reduce the risk of breast cancer. Adequate water intake will help prevent headaches, constipation, and kidney damage. And those are just a few examples! 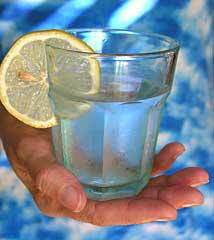 Water suppresses the appetite and helps the body metabolize stored fat. Studies have shown that a decrease in water intake causes fat deposits to increase, therefore, increasing water input reduces fat. Why? Because the kidneys need water to function properly. Without sufficient water for the kidneys, the kidneys cannot work adequately and so this affects some of the water going to the liver. One of the primary functions of the liver is metabolize fat into energy for the body. If the liver needs to do some of the work of the kidneys, the liver can not work as it should to metabolize fat and so more fat is stored in the body increasing weight and not using the fat as energy. 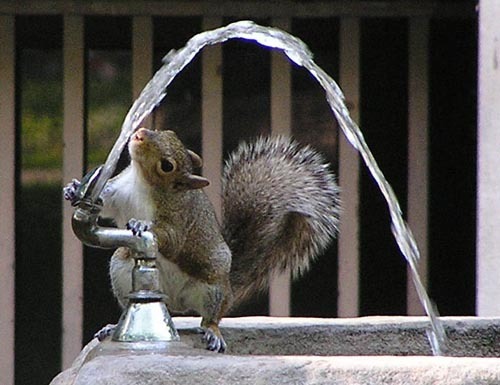 If you are not drinking enough water your body will store as much as possible as a defence mechanism. Retained water adds to your weight. If you have a water retention problem, drink more water! It may sound crazy but once the body is trained to expect a regular supply it will store less, leading to a reduction in your weight. Our bodies are made up of 55-70% water, but it does not replenish itself, so drinking water helps maintain that healthy balance. But even still, many will walk around dehydrated, most of the time unknowingly. That is because thirst is a poor indicator of dehydration. By the time someone gets thirsty, it is too late! Or, if one is thirsty, they may go for a beverage that does not actually replenish the body. Soft drinks may feel nice going down, but beverages with caffeine are not meant to hydrate. Pure water is the best remedy for dehydration. While some fruit juices and green tea may account for some fluid intake, you can not rely on beverages such as coffee or alcohol. They have a mild diuretic effect, which promotes urination and therefore water loss, which ultimately defeats the purpose. The Australian National Health and Medical Research Council (NHMRC) recommend adult males should drink a minimum of 2.6 litres, and adult women 2.1 litres per day. Of course intake needs to be increased depending on climate and exercise. The best indicator that one is drinking enough water is when urine comes out pale yellow to clear. A dark yellow colour, however, is a sign your body is dehydrated and is concentrating the urine in an effort to conserve water. This however, is not a viable indicator if you are taking Vitamin supplements that turn your urine yellow. It is possible to measure total body water and lean mass using an accurate Bioelectrical Impedance Analysis. In this way you can tell if your water consumption is adequate.